The newest art show is up! 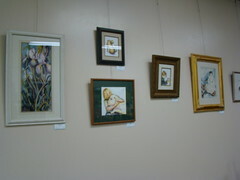 Helein Hart is our artist showing water colors through June 30th. Helein has studied with many different artists and has taught art for several years. Come in and take a look. Helein's art is affordable as well as beautiful. The coffee speaks for itself! Martine Locke scroll down to Monday March 30. New coffees in this week, working on an Etsy page, and working on class schedule for consumer classes.